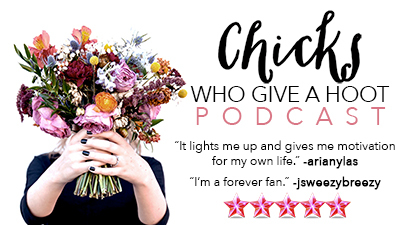 We are so excited to launch the fall season of the Chicks Who Give a Hoot Podcast! It has been an amazing and terribly busy summer, but we’re all looking forward and ready to dive back in. This season will bring some amazing new voices to the platform and continue to inspire us as we try to get involved, be change, and do good. I’m so happy you’re here. In this episode, internationally recognized artist and Creative Coach Carrie Seid shares her thoughts on creativity, how stereotypes about artists are damaging, and how art can start conversations leading to social justice and positive change. Creativity is a muscle, it’s an energy, it’s a force, it’s mysterious. Creativity is about seeing options. Like a giant peacock’s tail of possibilities. We live in a culture that is fed by stereotypes & classifications that can be deadly to creative people. Your ability to be creative it directly proportional to your ability to lose your identity. The starving artist stereotype is so cliche. Art comes from an enhanced ability to see. Turn your frustration into art. We are makers, so we better get out there and make the world how we want it.